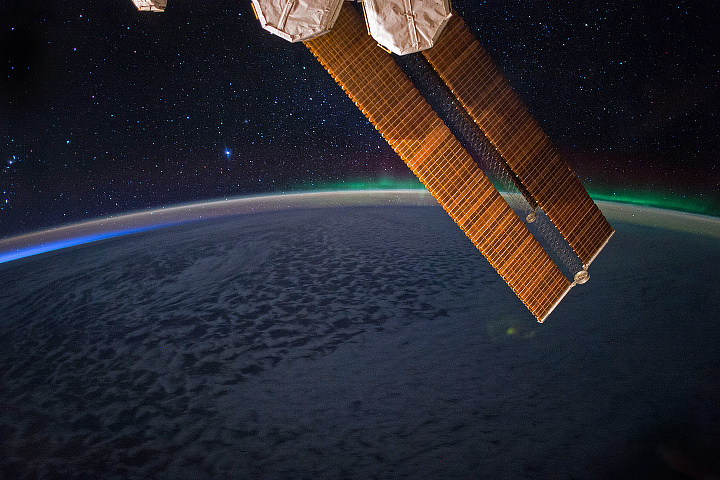 From space, the aurora is a crown of light that circles each of Earth’s poles. The IMAGE satellite captured this view of the aurora australis (southern lights) on September 11, 2005, four days after a record-setting solar flare sent plasma—an ionized gas of protons and electrons—flying towards the Earth. 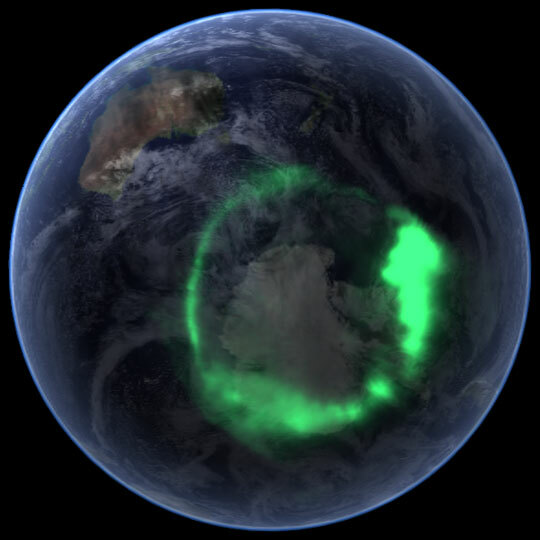 The ring of light that the solar storm generated over Antarctica glows green in the ultraviolet part of the spectrum, shown in this image. The IMAGE observations of the aurora are overlaid onto NASA’s satellite-based Blue Marble image. From the Earth’s surface, the ring would appear as a curtain of light shimmering across the night sky. Like all solar storms, the September storm distorted the shape of the magnetic field that surrounds the Earth. Without buffeting from the solar wind (charged particles like protons and electrons that are ejected from the Sun), the Earth’s magnetic field would look something like a plump doughnut, with the North and South poles forming the slender hole in the center. In reality, the nearly constant solar winds flatten the space side of the “doughnut” into a long tail. The amount of distortion changes when solar storms, such as the flare on September 7, send stronger winds towards the Earth. Changes to the magnetic field release fast-moving particles, which flow with charged particles from the Sun towards the center of the “doughnut” at the Earth’s poles. As the particles sink into the atmosphere, they collide with oxygen and nitrogen, lighting the sky with Nature’s version of neon lights, the aurora. Though scientists knew that the aurora were caused by charged particles from the Sun and their interaction with the Earth’s magnetic field, they had no way to measure the interaction until NASA launched the Imager for Magnetopause-to-Aurora Global Exploration (IMAGE) satellite in 2000. The satellite’s mission was to collect data that would allow scientists to study the structure and dynamics of the Earth’s magnetic field for the first time. Designed to operate for two years, IMAGE sent its last data to Earth in December 2005 after a highly successful five-year mission. Since 2000, IMAGE has provided insight into how the Earth’s powerful magnetic field protects the planet from solar winds. Without the shield the magnetic field provides, the upper atmosphere would evaporate into space under the influence of solar winds. IMAGE has shown scientists what sort of changes the magnetic field undertakes as it diverts solar winds from the Earth. For a summary of the discoveries that IMAGE has made possible, see IMAGE Discovers. From space, the aurora is a crown of light that circles each of Earth’s poles. The IMAGE satellite captured this view of the aurora australis four days after a record-setting solar flare sent plasma flying towards the Earth.